Will the Apple Watch succeed or fail? "The MacBook doesn't make a larger iPad moot," opined Ezra Gottheil, analyst with Technology Business Research. "When we talk about a keyboard-equipped iPad, it's something that would be easier and friendlier to use than a traditional Mac. It would also offer both a touch screen and a keyboard in the same device." The question about Apple's commitment to a larger iPad -- rumors that the company will produce one with a 12-in. screen have floated almost since the tablet's 2010 debut -- came not from anything Apple said Monday when it unveiled the new MacBook, but from the notebook's form factor. Tops on the evidence sheet: The MacBook weighed in at just over two pounds, 2.03 lbs. to be exact. That's nearly a third lighter than the current 13-in. MacBook Air. More importantly, it's about the same as an iPad Air when combined with a third-party keyboard. Tim Bajarin, of Creative Strategies, pointed that out in a post-event piece on Tech.pinions (subscription required). Bajarin wasn't kidding. Computerworld slapped an iPad Air and a 12-month-old Zagg Bluetooth keyboard on a kitchen scale, and the combination weighed 2.05 lbs., virtually the same as the 12-in. MacBook. Bajarin, who has long relied on an iPad + Zagg keyboard as his go-to device for taking to meetings, said that he would drop that kludge for a MacBook when the latter reaches retail April 10. 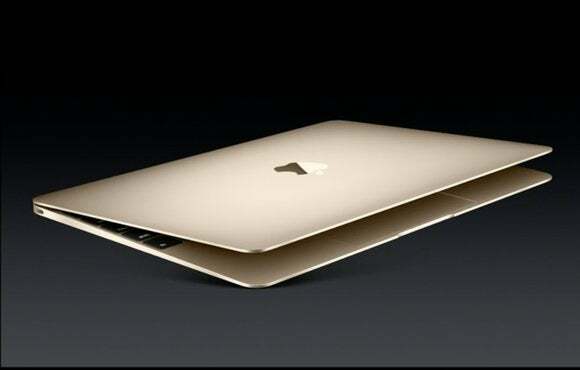 "No question that this MacBook will be my portable for work," Bajarin said in an interview. "Because it's even lighter than a combo of iPad and keyboard, [the MacBook will] be the thing that I'll be taking with me." But there will still be a place for a larger iPad in Apple's portfolio, Bajarin argued. "In business, tablets are essentially clipboard replacements," said Bajarin. "If Apple did go ahead with a larger iPad, it would clearly have as its mission to be a business tool in the context of a clipboard tablet." By "clipboard tablet," Bajarin meant a digital replacement for the paper forms many workers are required to fill out in the field, from police officers at an accident or crime scene to insurance agents strolling around a damaged car to utility workers on customer support calls. "Some may want to use a larger iPad as a pseudo laptop," said Bajarin, but those numbers would be dwarfed by the number who use it as, well, a tablet. The similarity in form between the MacBook and an envisioned 12-in. iPad, the analysts agreed, doesn't preclude the latter, in large part because the two run different operating systems, and thus appeal to different kinds of customers. At their most elemental, iOS stresses ease of use, OS X power and traditional productivity. "Looking at that, each would be focused on different customer opportunities," said Stephen Baker of the NPD Group. Some of the speculation about a larger iPad has focused on the possibility that Apple would join the 2-in-1 movement with an iPad + keyboard, mimicking Microsoft's Surface Pro 3. That kind of a device, which Microsoft trumpets as a notebook replacement, not a tablet as such, would be more of a direct competitor to the new MacBook and thus a potential cannibal to its sales. Apple hasn't roasted hybrids for some time. Three years ago, for example, CEO Tim Cook said, "You can converge a toaster and a refrigerator, but those things are probably not going to be pleasing to the user." That philosophy hasn't changed. "Apple doesn't believe touch is viable in a laptop," said Bajarin, discounting the possibility of a Surface Pro-like iPad. "They are focusing on tablets rather than tablets with keyboards." This story, "New MacBook does not make moot a big iPad" was originally published by Computerworld.